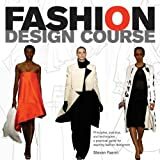 A widely-recognized fashion design teacher presents a series of step-by-step tutorials and exercises, and offers students extensive advice on how to prepare for a successful career in the glamorous fashion design industry. The book opens with an overview of the principles of fashion design, a survey of the industry's history and its key designers, and a description of today's markets and customers. The tutorials that follow instruct in designing sportswear, tailored garments for wear to business careers, denim/activewear, cocktail and evening wear, children's clothing, men's garments, and accessories. The author also advises on creating and presenting a fashion portfolio, and on "selling" oneself in a job interview. His several discussions with some of the industry's leading professionals give students valuable insights on how to create and develop one's own original collection. Fashion Design Course is a fine introduction for students, dressmakers, and all others aspiring to careers in this dynamic and rewarding industry. More than 450 how-to color illustrations.